Bigger stadiums, higher profile, a greater financial windfall and a growing ensemble of international stars. That's just some of what could await in the relative glitz and glamour of the Women's Super League (WSL) for one of five teams vying for promotion from the Women's Premier League (WPL). The WSL has a first and second division and the winners of the WPL's Northern and Southern Divisions meet in an end-of-season play-off on Sunday, 24 May with the victor of that game promoted to WSL 2. With just a handful of games to go, BBC Sport takes a look at the teams challenging for promotion. League leaders Coventry City have played a game more than their rivals but have a three-point advantage. They have won four games on the spin, scoring 18 goals in the process, but are away from home for all three of their remaining league matches. The Sky Blues, whose only league losses this season have been against nearest rivals Sheffield FC, claimed the Southern Division crown last season before being moved into the Northern Division. "To have three games left and have the opportunity to win the league is testament to how hard everyone has worked," manager Craig Nicholls told BBC Sport. "Winning back-to-back titles would be an unbelievable achievement and this year promotion has been our big aim. "We want to be the side that shows how good the (WPL) Southern and Northern leagues are. There are some very talented players at this level who could easily play in Super League and be among the best of them." Second-placed Sheffield FC have a game in hand and superior goal difference but also have a second consecutive FA Women's Premier League Cup Final to look forward to on 3 May. They beat rivals Coventry 1-0 away on 29 March, but were then beaten 2-1 at fourth-placed Blackburn on 7 April. 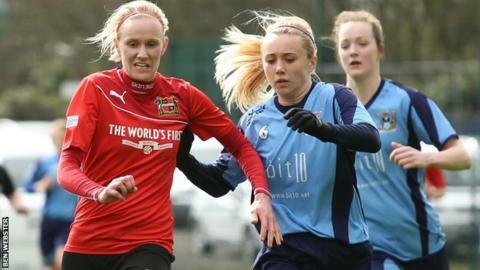 Sheffield FC Ladies, who are affiliated with the oldest football club in the world (Sheffield FC, who play in the eighth tier of men's football), won the Northern division last season. "I honestly don't know how we're in the position we are, given the injuries that we've had all year," manager Helen Mitchell told BBC Sport. "Coventry have had a fantastic season. They've got great depth to their squad. "It is going to be difficult. None of those games are easy, when it comes to the end of the season." With three games remaining, Portsmouth FC are top of the league. After reaching the quarter-finals of last season's FA Women's Cup, the club have already shown they are capable of competing with the big-name sides. "Before the promotion opportunity opened up, we set a target of a top-two finish," first-team manager Perry Northeast told BBC Sport. "We won't define our success on the materialistic prize of winning a trophy or not. It has been a very long season. "I gained a much higher level of satisfaction when, for example, we beat Cardiff City LFC away for the first time in our history. "Goals have been shared throughout our team and, from the back to the front, they are all proud just wearing the badge. One point behind Northeast's side are Brighton & Hove Albion, who have won five games in a row since losing at Portsmouth on 15 March. Brighton need to rely on Portsmouth slipping up in order to reach the play-off, but two of their three remaining games are against bottom-club Keynsham Town. "Any team can beat anyone in this league. We certainly won't be taking Keynsham lightly," first-team manager James Marrs told BBC Sport. "The fact that they've already been relegated makes then more dangerous, as they will have nothing to lose. "It's been a transitional season. The girls have all had to step up and try to get a real team bond. It's been a team effort." Elite women and girls football manager Tracy Doe added: "I think the gap (to the Women's Super League) is smaller than ever. "Our centre of excellence (for 16 to 19-year-olds) means that we already have England internationals in our setup. "The support from the whole club has been huge." FA Women's Cup quarter-finalists Charlton Athletic complete the five teams who submitted the necessary paperwork to be considered for promotion before the deadline expired on 31 March. They were the only team from outside of the WSL to reach the last eight of the FA Cup this season, but were knocked out on penalties by 2014 runners-up Everton. Third-placed Charlton can still mathematically reach the play-off game, but after a 2-1 victory over Tottenham on Wednesday, they currently lie five points behind leaders Portsmouth with three games to play. As well as on-pitch matters, clubs must make adjustments off the field before they can be promoted to the WSL. In order for clubs to meet The FA WSL Licence minimum requirements, they need to meet specific criteria. Financial and business management, including the appointment of a general manager and marketing officer and detailed financial plans. Commercial sustainability and marketing, including a specific marketing plan demonstrating how specific targets around attendance will be achieved. Facilities demonstrating that playing, training, changing, medical, spectator, broadcasting and hospitality facilities are of a certain quality. Player/youth development, including the appointment of appropriately qualified coaches, physios, doctors, strength and conditioning experts and demonstrating strong partnerships with key agencies that can support player development, such as FA Licenced Centres of Excellence, County Football Associations and universities. Additional reporting by Andrew Aloia and Jo Currie. Full league tables and results can be found on the BBC's women's football index. One club for 8.6 million people?